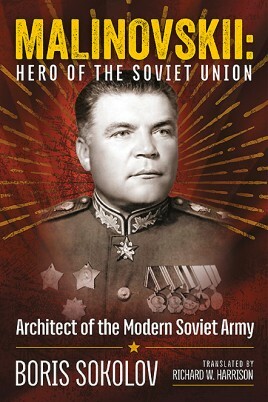 The prolific writer Boris Sokolov - author of biographies of Georgii Zhukov and others - returns with a new book on Rodion Yakovlevich Malinovskii (1898-1967): a Marshal of the Soviet Union and former Defence Minister, who like so many of those who made their name during the Great Patriotic War, joined the Tsarist Army at the outbreak of the First World War. Unlike the others, however, his service took him to France as a member of the Russian Legion - a move designed to show Russia’s support for its French ally in the struggle against the Germans on the Western Front. Despite the Bolshevik coup and Soviet Russia’s withdrawal from the war, Malinovskii elected to remain in France and serve with the French Army until the Armistice - after which he made his way back to Russia, where he joined the Red Army in the waning days of the Civil War. The young Malinovskii chose to remain in the army and rose steadily through its ranks. He was later sent to Spain as a Military Advisor to the Spanish Republic during that country’s Civil War. This fortuitous posting not only allowed Malinovskii to gain valuable combat experience, but also kept him out of the country at a time when Stalin’s military purge was gutting the Armed Forces. However, it is Malinovskii’s service during the Great Patriotic War that constitutes the heart of this book. Sokolov traces his subject’s rise from corps to army commander, and finally to the command of various fronts. During 1943-1944 the forces under Malinovskii’s command played a major role in expelling the Germans from the Donets Basin, Southern Ukraine, Romania, Hungary, Austria and Czechoslovakia. Following the defeat of Germany, Malinovskii was assigned to command the Main Front in the brief war against Japan and remained as Commander-in-Chief of Soviet forces in the Far East for several years. He was summoned back to Moscow as Deputy Defence Minister and later took an active part in the removal of his boss, Georgii Zhukov, whom he replaced in 1957. It was under his decade-long tenure that the Soviet Armed Forces made the transition to a truly modern force - and changed the country’s status from that of a regional power to superpower. "A fine account of the life of Rodion Malincskii, the man who helped transform Russia into a superpower..."